Maha Shivaratri is considered the most auspicious time to please Lord Shiva to gain his blessings. What is the simplest way of appeasing Lord Shiva? Offer him Bilva leaves. The most terrible karma is destroyed when a Bilva leaf is offered to Lord Shiva. 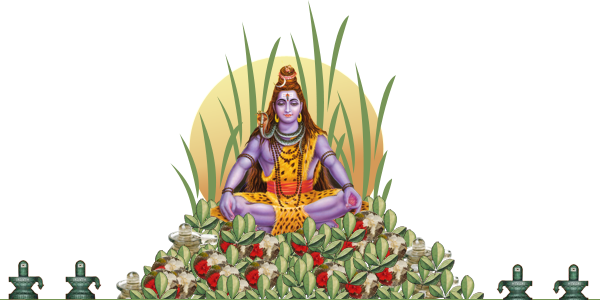 The unbelievable merits one receives on offering a single Bilva leaf to Lord Shiva are described in the 9 verses of the sacred hymn known as Bilvashtakam. Just like Tulsi plant is sacred to Lord Krishna and Durva grass is sacred to Lord Ganesha, Bilva tree is sacred to Lord Shiva. Since the Bilva leaf has such significance in the worship of Lord Shiva, it is common to find Bilva trees cultivated in the vicinity of Shiva temples. 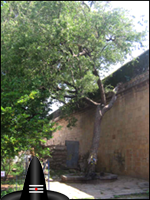 According to Shiva Purana, the great epic on Lord Shiva, the Bilva tree is the manifest form of Lord Shiva himself, while all the great tirthas (pilgrimage places) are said to reside at its base. One who worships the Shiva Linga while sitting under the Bilva tree attains the highest bliss of oneness with Lord Shiva. Ayurveda (science of health) values the Bilva highly for the medicinal properties contained in its root, fruit and leaves. These are used in various Ayurvedic preparations. Root – A preparation made from the root with ginger and toasted rice cures vomiting. For the treatment of piles, dysentery and diarrhoea, a preparation is made from the root mixed with another tuberous root. The oil extracted from the Bilva root, boiled with the juice of Bilva leaves and applied to the head is excellent for nasal catarrh and diseases of the ear. Fruit – Its pale tawny flesh is sweet and astringent, containing tannin, which acts as an astringent to the bowels. It has a pleasant, agreeable and aromatic flavor, and provides an excellent dietary supplement. The pulp of the dried Bilva fruit, powdered and mixed with arrowroot, is called ‘dietetic Bel’. It is both a sustaining food and a curative medicine. Leaves – The consumption of Bilva leaves alleviates diseases caused by excess vata and kapha (mucus). They are also useful in diabetes mellitus. For this, a few leaves should be chewed daily and their fresh juice drunk. They are diaphoretic (producing more perspiration), thus reducing temperature and lowering fevers, and an aphrodisiac. A decoction of leaves is a favorite remedy for ailments that often occur during seasonal changes, such as fever, flu and fatigue. May the next tree you plant be a Bilva Tree! It will not only show your commitment towards greening the environment, but also display your concern for humanity, given such divine merits and medicinal value of the Bilva Tree. A bilva sapling must be tenderly nurtured and protected until it has reached a certain height right for transplanting. Quite like a fragile baby bird that must be carefully tended until such time it leaves the nest to flourish independently. AstroVed will arrange to have your sponsored sapling cared for at Tripura Foundation’s charity project ‘HoPE Town’ in the agricultural vocational until until such time in it’s development where it will be donated to a Shiva Temple. It’s leaves will then be used in temple rituals and festivals. Your sponsorship of a sapling will benefit those who are served in the charity program by giving work, benefit the temple by providing not only the leaves but for the energy that the tree will bring to the surroundings as a place in itself for worship and the mature tree will provide a source of traditional herbal medicine. You’ll be benefited by having the grace of Lord Shiva showered upon you for this act. If such is the value of one Bilva leaf, you can imagine the unsurpassable worth of the Bilva tree itself. It is said that merely seeing and touching a Bilva tree frees one from sins.